Stadium Nissan's Express Lube Service! 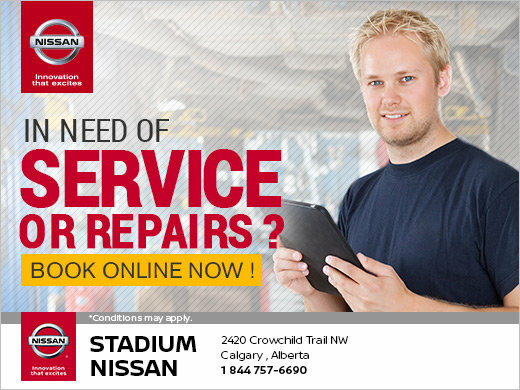 With Stadium Nissan's Express Lube Service, there's no need to book an appointment! One reason. Because our customers asked us to. It really is that simple! Since Stadium Nissan began, our customers have told us what is important to them. We've been listening for over 25 years and your feedback helps us to continue to make your service experience as quick and as seamless as possible. Booking an Express Service appointment is much like making a reservation at your favourite restaurant. We know you're coming and we have reserved your spot. There's very little wait time and we are ready to give you our best service possible, in as little time as possible. Our goal is to have you back on the road in just under an hour. Offering our customers Express Lube Service appointments helps us to be able to consistently deliver the best customer service possible. If your schedule is more flexible or booking in advance just isn't your style, no problem! Swing by and we will ensure the same great service, it just might take a little bit longer. Express Lube Service drop-in appointments are offered on a first come, first served basis. We know you're busy and we make every effort to get you in as quickly as possible and have you back on the road doing the things you enjoy. Stadium Nissan's Express Lube Service is designed for your convenience. Our factory-trained Service Staff accurately identify your needs and use Nissan Advantage Parts to service your vehicle. This keeps more money in your pocket and provides you with high quality parts. Our fully warranted Nissan parts are manufacturerd to original equipment standards specifically for your vehicle. We recommend dropping by between 8:00am - 11:00 am or between 1:00 pm - 4:00 pm to avoid the rush during peak times. Come in, grab a coffee and relax in one of our waiting areas equipped with free Wi-Fi, and complimentary newspapers. WHAT`S THE DIFFERENCE BETWEEN EXPRESS LUBE SERVICE AND REGULAR SERVICE MAINTENANCE? Nissan's preventative maintenance programs proactively address your vehicle's needs. Following the Regular Service Maintenance schedule recommended by Nissan Canada helps prolong the life of your vehicle and keeps it functioning at optimum levels. Express Lube Service are basic, routine services that maintain your vehicle to warranty approved specifications. DO YOU REALLY HAVE 20 SERVICE LOANER VEHICLES? We do! We strive to make your full-service experience as stress-free as possible. That's why we offer 20 Service Loaner vehicles. Here's a tip: If you know you will need a Service Loaner when you schedule your regular service appointment, give us a heads up. The more advance warning we have, the better we can accomodate your needs. Our service department is committed to providing all of our customers an excellent experience in all aspects of our dealership.